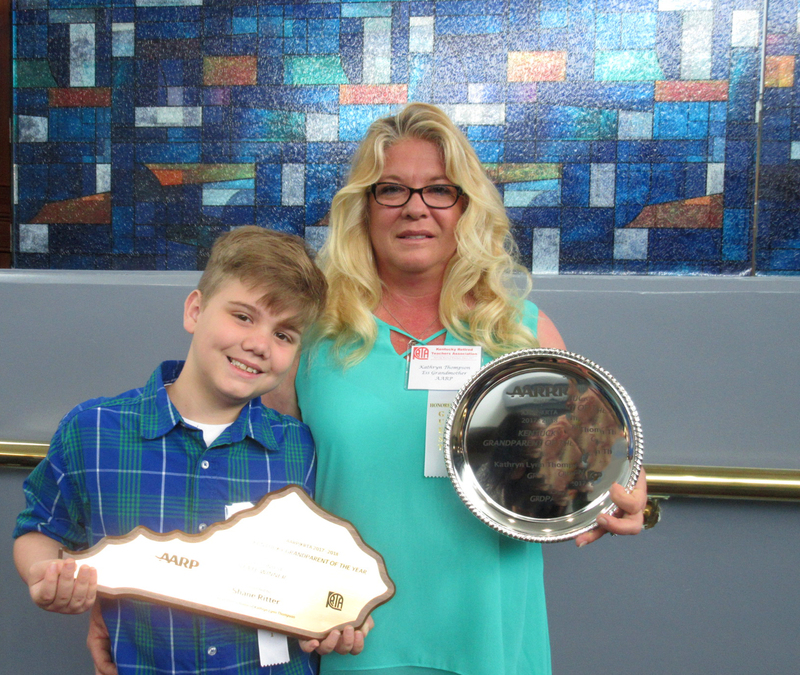 Shane and his grandmother, Kathryn Thompson, received their awards at the 17th Annual “AARP Kentucky Grandparent of the Year” ceremony at the KRTA Annual Convention in Louisville. He was selected from thousands of student entries across 270 schools in 102 Kentucky counties. Old Mill Elementary 5th grade teacher, Michelle Grey, encouraged Ritter and her students to write about what makes their grandparents special. In its 17th year, the annual contest highlights the nurturing relationship between grandparents and their grandchildren. “The essay contest is an important way to recognize the special bond between grandchildren and their grandparents. It’s our way to honor how much grandparents bring to the lives of grandchildren,” said AARP Kentucky’s State President Charlotte Whittaker of Hartford. There are now more grandparents in the U.S. than ever before — some 70 million, according to the latest census. That’s a 24 percent increase since 2001. In fact, of all adults over 30, more than 1 in 3 were grandparents as of 2014. AARP and KRTA share a long history and continue to work together to grow the annual essay contest. Essays are judged on grammar, form, neatness, creativity, expression and characteristics of the grandparent. Local volunteers from KRTA’s 118 Units facilitate the contest and the winner is selected by a panel of AARP and KRTA representatives. Shane received a $100 award and special plaque and his grandmother received a commemorative award from AARP, and Ms. Grey received $150 for teaching supplies.